Why would a Muslim become a Christian? If you've ever wondered that question, here's a great interview with the son of a top Hamas leader. This young man made international news last month because he abandoned the religion of his fathers to trust Jesus alone to save him from God's judgment on his sin. The above clip gives only a short bit of his interview, to read the full thing you will need to read it here. Earlier this week, our refrigerator quit. To be more precise, the compressor did. All it did was make a repeated, feeble noise attempting to start up. Dad started poking around to find the start capacitor, thinking maybe it was the problem. Never did find the start capacitor, but when he plugged it back in, the compressor kicked right in! It's been working fine ever since! Now why did God allow our fridge to die only to resurrect it an hour later? I'm not denying there were natural forces at work (this fridge is certainly old enough to die! ), but I'm looking at the bigger issue of why God allows things like this. A partial answer may be this: I don't appreciate things much until I lose them. The more I age, the more I appreciate the health I have left. When I've had difficulty sleeping, sleep became incredibly precious to me. When looking for a church to join (and finding mostly bad ones) the few good ones became all the more delightful. And losing the refrigerator caused me to realize what a blessing it is to have had a fridge that has served us so faithfully for so many years. And thanks for taking away our blessings sometimes so that we appreciate them more. I am starting to do some simple English Bible lessons with men over Skype. This is a great way for them to practice their English and learn more about the Bible at the same time. I don't yet have a regular schedule set, but it will probably be either morning or evening my time (Pacific time, GMT -7). If you are interested in joining, send me an email. I will send you emails to tell you when the next English Bible lessons will be. If you are a woman, my Mom is doing the same thing for women. In my last post about Islam, I focused on their aggressive apologetics. This time I want to show you some examples of the other side of Islam, which is softer, gentler, more appealing and even a bit humorous. In contrast to the Muslims of apologetics, these Muslims are better mannered, speak better English, and fit in much better with American culture. First, check out this short YouTube video called "I am a Muslim". "Children of Israel, serve God, my Lord and your Lord." and the fire shall be his home. None shall help the evil-doers. For a more complete description of this passage (including how Muslims explain the verses that contradict it) read this excellent, short article. For more on how "low" an "unbeliever" is in a Muslim's eyes, this article is good. Thus, the friendly Muslim's statement that he doesn't regard us as unbelievers is untrue to the Quran. Here's another very appealing video about a teenage Muslim boy's experience at the beginning of a month of Ramadan. If you watch carefully, you'll observe how the focus in Islam is on externals, not the heart. Notice how much of American culture the "soft Muslims" have adopted, including heavy use of American music styles. American Islam has apparently discovered how to be "seeker sensitive". Fundamentalist Islam is more common but less appealing than seeker sensitive Islam, just as fundamentalist Christianity is less appealing but more accurate than seeker sensitive Christianity. Seeker sensitive Islam is more likely to result in Americans converting to Islam than fundamentalist Islam. The only way Christianity can truly spread is not through being more clever and slick in our marketing, which the Muslims have demonstrated their ability to duplicate. We need to drop all our gimmicks and come back to simply following Jesus as revealed in the Bible and trust that God will "bear witness to the word of His grace". (Acts 14:3) We need to get to the point where if God doesn't show up, we're sunk. How many of our churches are still going through the motions despite the fact that God has long since departed from their midst? I hope these videos motivate us to pray for God to reveal Himself to Muslims and open their eyes to the truth, even now as they observe their month of fasting. We do regard Muslims as "unbelievers", yet for us, this does not mean "my enemy". If Jesus had not saved me, I would be worse than a Muslim. These videos should make us cry out in loving prayer for the Muslims, not lash out in anger. These videos are being produced by MAS Media Foundation, an American Islamic public relations group. That link will take you to their YouTube channel where you can watch a number of their videos. Three recent incidents gave me a new appreciation for people who went beyond the call of duty in showing kindness to me. 1. A few weeks ago when I traveled to the a conference in Phoenix to represent VOM, I rode down with some people from a church near our home. It’s not the church I attend, but we do have a number of friends there and no one from my church was going. I had actually gotten a ride with them 2 years ago also. When the conference ended at 4 PM, I stayed in the exhibit hall for a few extra minutes, thinking that a few last minute stragglers might come by to see the VOM table. I think only one came – the exhibit hall was not in a good location and everyone was probably in a hurry to get home. Remembering that 2 years ago it had taken the church group a while to all reassemble at the church van, I figured I had some time before I had to get back to the church van myself. (Bad logic on my part, because there were a lot more people on the van 2 years ago than this year.) So I gabbed with the people at the Gospel for Asia table while waiting for the crowd that never came. When I did finally amble out to the church van about 4:20, I was dismayed to discover that everyone else was already in the van waiting for me, and in fact they had moved the van closer to the church so I didn’t have as far to walk! But rather than being upset at my lateness, the first thing the pastor’s wife noticed was that I was carrying a large and somewhat heavy pile of stuff – two boxes with my lunch box on top. She and the pastor and another guy got out of the van and came over and took the load off my hands. And they never said a word about having to wait for me (I apologized anyways). Just a simple act of kindness, but for some reason it meant a lot to me. 2. Last week, a rep and I got into a very sensitive situation related to an upcoming rep opportunity. While I can’t give you the details, I can assure you that if you knew the details you would be glad you didn’t have to handle it. Since my manager was out of the country, I emailed the situation to the department director Mr. B expecting nothing more than perhaps a few words of advice when he got time. To my surprise, Mr. B immediately jumped into the situation with us and helped bring a surprisingly positive conclusion to it. It was a blessing to me that someone with as much stress on his shoulders as Mr. B was willing to help out with something that he could have merely directed from a distance. Yes, [another woman] and I are on our way, keep us in your prayers. I was very challenged by Lu’s courage in this situation. The common element of all three stories is that these people went beyond what mere duty required to do an act of kindness that was a great blessing to me and others. May Jesus build this same “beyond the call” love into my own heart. Because He is the best example of this kind of love. After all the ways we have flaunted Him, mocked Him, ignored Him, and robbed Him, He could have stayed in heaven's glories and sent us all to hell -- and been totally just in doing so. Instead, He chose to take upon Himself the punishment of God that we deserved and make it possible for us to be rescued from both sin and hell. Now that is going beyond the call of duty! In the past two years as I have met Muslims on Skype and gotten to know their religion better, I have been impressed -- and worried -- by their zeal in defending their faith. Touch their religion and you often receive a surprisingly visceral response. For a peaceful religion, they really have a lot of hot buttons. If you make remarks about the Trinity, Muhammad, or the violent passages of the Quran -- be prepared for a vigorous defense. There is a commendable aspect to this. From my (very limited) experience, it seems Muslim young people are being better trained in apologetics than Christian young people. Please watch this 10 minute YouTube video by a young Muslim and then read my comments below. How many American Christians could answer this guy's arguments? He came up with a surprisingly compelling argument. It is totally false, but it is not easy to see the falseness on the surface. I'm not totally sure what it is... the condescension and passion in his eyes... the rather unusual black garments... but to me, he looks rather creepy! To know the Bible better. To go as missionaries to Muslims (whether here in the west or internationally). Most Muslims have never had a real Christian as a neighbor. The Christianities that most Muslims have seen are false, weak, distorted versions. One good, free resource is Dr. James White's YouTube section on countering Islamic arguments. Sometimes humor is the best conveyor of truth. I found this short video quite humorous and accurate. Thanks to Voddie Baucham's blog for the link. Here's an interesting Muslim site explaining Ramadan (the obligatory month of fasting) for English-speaking Muslims. Exempted from the fast are the very old and the insane. On the physical side, fasting is from first light of dawn until sundown, abstaining from food, drink, and sexual relations. On the moral, behavioral side, one must abstain from lying, malicious gossip, quarrelling and trivial nonsense. The last sentence kind of worries me. It's OK to do those things the rest of the year? God doesn't have favorite days for worship--except for today! Of the virtues of fasting is that it is a means for atonement of sins. Of all the statements, this is the saddest. The means of atonement for our sins is the most crucial question a human can contemplate. It is the question of questions that we cannot afford to answer wrongly! The consistent message throughout the Bible is that atonement is only possible through faith in the blood of a sinless substituted sacrifice. "In him [Jesus] we have redemption through his blood, the forgiveness of sins, in accordance with the riches of God's grace that he lavished on us with all wisdom and understanding." -- Ephesians 1:7-8, NIV. Performing the other acts of worship and duties is most important, and salah (ritualistic prayers) in particular, without which no other act of worship is accepted by Allah. Praying in congregation is a great aspect in our religion. Everyone should attend: its reward is twenty seven times greater than that which is performed individually. The Prophet (peace be upon him), was just about to burn the houses of those who did not attend the congregational prayers. The precision (27) really interests me. Check out the site, and may it stir us all up to pray for our Muslim fellow-men. Click here for a good Christian web site giving information on how to pray for Muslims during Ramadan. While sitting in Mom's flower garden this morning, I saw a large and beautiful swallowtail butterfly fluttering around, getting snacks from the zinnias and other flowers. Suddenly, quick as a wink, a praying mantis snatched the butterfly from mid-air with its spiked, raptorial forelegs. The mantis had been hiding just below one of the flowers, blending in perfectly with the flower stem. A fierce struggle ensued. The butterfly had only one hope of escape: its large and powerful wings. If it could flap free of the mantis, or even just pull the mantis away from the flower stalk with it, it might survive. Alas, the grip of the mantis was too strong. 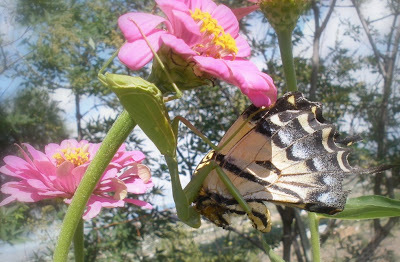 It wasted no time moving its demonic-looking mouth in for a snack of its own, which both weakened (and ultimately killed) the butterfly and strengthened the mantis. By the time I snapped this picture (you can click to enlarge it), the butterfly had already begun to shrivel as the mantis sucked the vital juices from its body. Sorry if this makes you sick. I got a little grossed out myself (which reconfirmed that God has not called me to be a doctor).